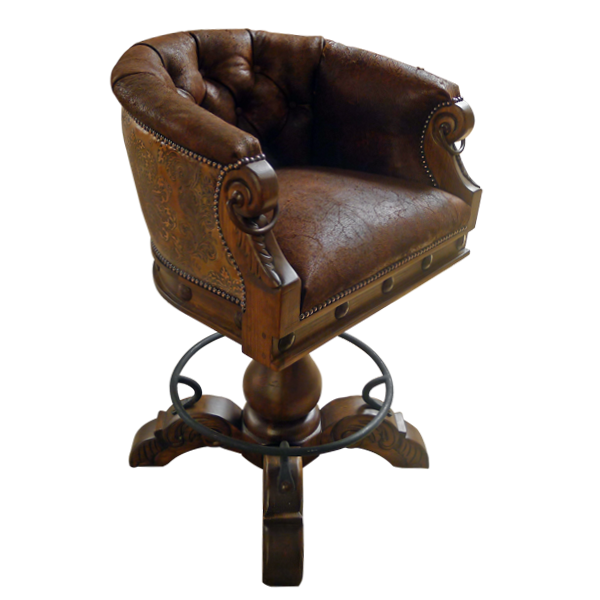 Reflecting its old world heritage, this luxurious Spanish colonial designed bar stool has antique style full grain leather on the seat and on the inside seat back. Intricate button tufting graces the central part of the inside seatback, with contrasting patterned full grain leather on the reverse seatback. With its horseshoe shape this bar stool is both beautiful and comfortable. The lower body of the seat is decorated with hand forged iron conchos and the full grain leather upholstery is hand tacked with care around the entire body. The armrest are decorated with hand carved scrolling and each armrest has a hand forged iron ring made by our craftsmen. The entire seat is resting on a hand turned wood trumpet pedestal that is supported by four robust wood feet, joined by a hand forged circular footrest. This bar stool swivels 180° and is 100% customizable.